The lifeblood of our league is active, organized and passionate groups of drone racers. There are more than 600 active MultiGP chapters worldwide. They currently are responsible for more than 95% of all drone sporting events worldwide. MultiGP chapters are run entirely by passionate, hard-working volunteers. The race chapter is the key to the success of drone sports – without places to compete, and the people to organize it, there is no sport! Find a Chapter | Start a Chapter | What is a MultiGP Chapter? MultiGP understands this, and in response has developed the race chapter system. This system includes the organization, resources, and mentoring that are the foundation of the race chapter’s success. MultiGP provides the software, equipment and support for clubs to run safe, efficient, competitive and above all, enjoyable drone races. These tools and support system are crucial to the growth of a race chapter. As a race chapter completes various growth-bolstering requirements, they advance through MultiGP’s tier system. Advancing through the tier system affords the chapter certain benefits, such as race gates, race flags, and additional opportunities. Upon reaching Tier 3, chapters are sent racing gates – the fundamental building block for any drone race course. Tier 2 chapters receive racing flags, allowing chapters to get more creative in their track design. 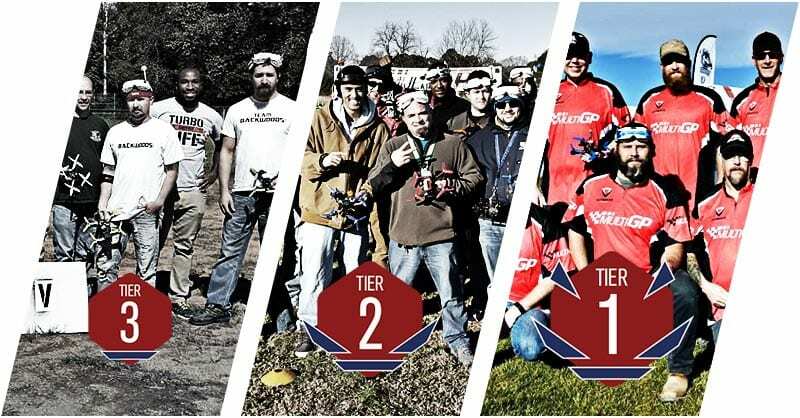 Tier 1 chapters are powerhouses of drone racing clubs. They are capable teams of passionate volunteers that can of operate large races quickly and efficiently. Tier 1 chapters receive additional awards and discounts not available to other tiers: such as MultiGP team jerseys, prize packs to elevate their local races and the steepest discounts with affiliates. Start a Chapter today. It's Free!